A season is a division of the year  marked by changes in weather, ecology, and amount of daylight. 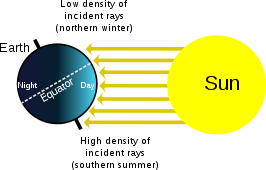 On Earth, seasons result from Earth's orbit around the Sun and Earth's axial tilt relative to the ecliptic plane. In temperate and polar regions, the seasons are marked by changes in the intensity of sunlight that reaches the Earth's surface, variations of which may cause animals to undergo hibernation or to migrate, and plants to be dormant. Various cultures define the number and nature of seasons based on regional variations. In some parts of the world, some other "seasons" capture the timing of important ecological events such as hurricane season, tornado season, and wildfire season. [ citation needed] The most historically important of these are the three seasons— flood, growth, and low water—which were previously defined by the former annual flooding of the Nile in Egypt. 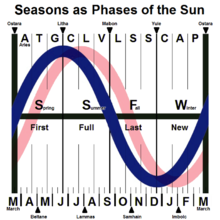 Compared to axial tilt, other factors contribute little to seasonal temperature changes. 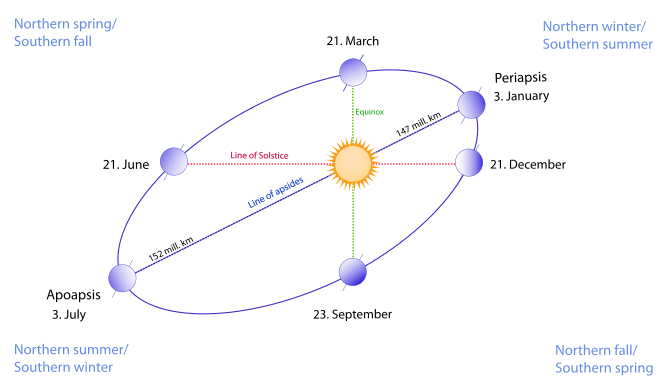 The seasons are not the result of the variation in Earth's distance to the Sun because of its elliptical orbit. In fact, Earth reaches perihelion (the point in its orbit closest to the Sun) in January, and it reaches aphelion (the point farthest from the Sun) in July, so the slight contribution of orbital eccentricity opposes the temperature trends of the seasons in the Northern Hemisphere. 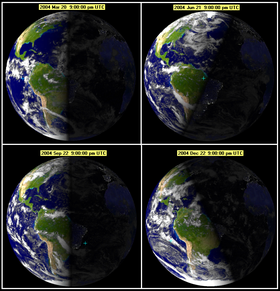 In general, the effect of orbital eccentricity on Earth's seasons is a 7% variation in sunlight received. Meteorological seasons are reckoned by temperature, with summer being the hottest quarter of the year and winter the coldest quarter of the year. In 1780 the Societas Meteorologica Palatina (which became defunct in 1795), an early international organization for meteorology, defined seasons as groupings of three whole months as identified by the Gregorian calendar. Ever since, professional meteorologists all over the world have used this definition. Therefore, for temperate areas in the northern hemisphere, spring begins on 1 March, summer on 1 June, autumn on 1 September, and winter on 1 December. For the southern hemisphere temperate zone, spring begins on 1 September, summer on 1 December, autumn on 1 March, and winter on 1 June. In Australasia the meteorological terms for seasons apply to the temperate zone that occupies all of New Zealand, New South Wales, Victoria, Tasmania, the south-eastern corner of South Australia and the south-west of Western Australia, and the south east Queensland areas south of Brisbane. 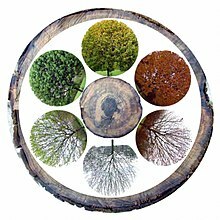 The solar seasons change at the cross-quarter days, which are about 3–4 weeks earlier than the meteorological seasons and 6–7 weeks earlier than seasons starting at equinoxes and solstices. Thus, the day of greatest insolation is designated "midsummer" as noted in William Shakespeare's play A Midsummer Night's Dream, which is set on the summer solstice. 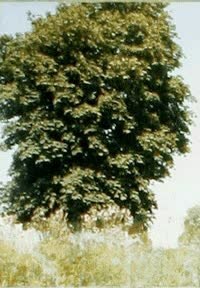 On the Celtic calendar, the start of the seasons corresponds to four Pagan agricultural festivals - the traditional first day of winter is 1 November ( Samhain, the Celtic origin of Halloween); spring starts 1 February ( Imbolc, the Celtic origin of Groundhog Day); summer begins 1 May ( Beltane, the Celtic origin of May Day); the first day of autumn is 1 August (Celtic Lughnasadh). The traditional calendar in China forms the basis of other such systems in East Asia. Its seasons are traditionally based on 24 periods known as solar terms. The four seasons chūn ( 春), xià ( 夏), qiū ( 秋), and dōng ( 冬) are universally translated as "spring", "summer", "autumn", and "winter" but actually begin much earlier, with the solstices and equinoxes forming the midpoint of each season rather than their start. Astronomically, the seasons are said to begin on Lichun ( 立春, lit. "standing spring") on about 4 February, Lixia ( 立夏) on about 6 May, Liqiu ( 立秋) on about 8 August, and Lidong ( 立冬) on about 7 November. These dates were not part of the traditional lunar calendar, however, and moveable holidays such as Chinese New Year and the Mid-Autumn Festival are more closely associated with the seasons. Indigenous people in polar, temperate and tropical climates of northern Eurasia, the Americas, Africa, Oceania, and Australia have traditionally defined the seasons ecologically by observing the activity of the plants, animals and weather around them. Each separate tribal group traditionally observes different seasons determined according to local criteria that can vary from the hibernation of polar bears on the arctic tundras to the growing seasons of plants in the tropical rainforests. In Australia, some tribes have up to eight seasons in a year,  as do the Sami people in Scandinavia. Many indigenous people who no longer live directly off the land in traditional often nomadic styles, now observe modern methods of seasonal reckoning according to what is customary in their particular country or region. Any point north of the Arctic Circle or south of the Antarctic Circle will have one period in the summer called 'polar day' when the sun does not set, and one period in the winter called 'polar night' when the sun does not rise. At progressively higher latitudes, the maximum periods of " midnight sun" and " polar night" are progressively longer. ^ Khavrus, V.; Shelevytsky, I. (2010). "Introduction to solar motion geometry on the basis of a simple model". Physics Education. 45 (6): 641–653. Bibcode: 2010PhyEd..45..641K. doi: 10.1088/0031-9120/45/6/010. ^ Khavrus, V.; apple, I. (2012). "Geometry and the physics of seasons". Physics Education. 47 (6): 680–692. doi: 10.1088/0031-9120/47/6/680.